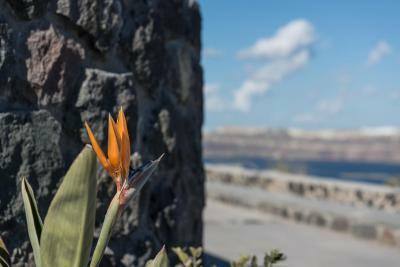 Lock in a great price for Elements of Caldera Suites – rated 9.6 by recent guests! Everything was perfect. The view from the hotel is amazing. Amazing experience from A to Z. Staff of remarkable and the view is unreal. Heaven heaven heave. The staff is very nice and helpful,they don't take comission for tours and car rentals. Help with everything you need even if not related to the hotel. Very clean and spacious. Two showers in the suite Breakfast served to the room. Perfect place with amazing view. Big room with internal hot tub, wonderful breakfast served to our room daily, and above all hospitaity of Julia and the staff was above and beyond.. 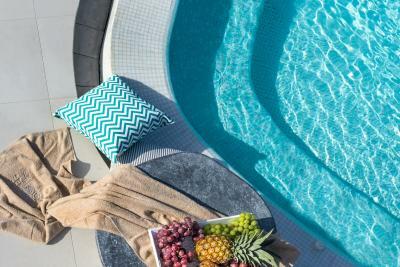 This hotel is a fabulous place to stay, it has amazing views with fantastic staff that are there to help when needed but provide space and privacy to enjoy the views, the pool and your own private jetted tub. 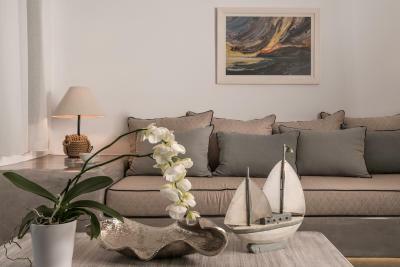 We had the pleasure of dealing with Julia as we were affected by a ferry strike, she was able to rearrange our booking without any stress and she ensured our stay was as relaxing as possible.. which it was. 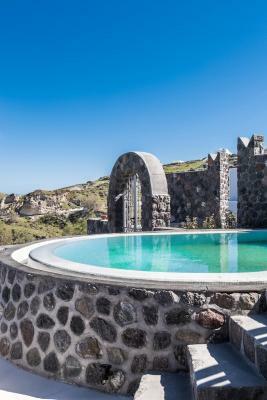 I highly recommend Elements of Caldera Suites as a place to stay, the rooms are large and spacious and there is plenty to do and see in the area including an amazing sunset. 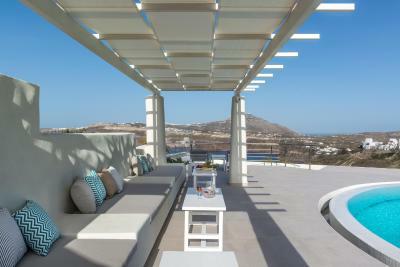 It is in the quieter side of Santorini which we liked as you are only a 15 minute drive to the bigger towns. Staff and facilities were perfect. Great value for money. The rooms were beautiful. Everything was perfect!Clean, polite staff,beautiful comfortable room. The hotel has amazing facilities. Rooms are huge and very confortable. 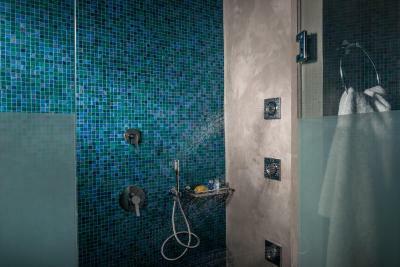 The shower is the best I have seen. 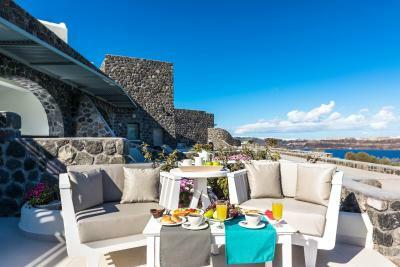 Breakfast is delivered to the room and you can chose from several options, everything is delicious. The hotel was more amazing than we expected. 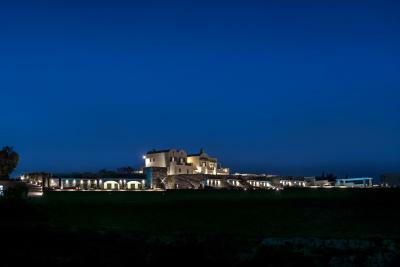 If you are searching for a quiet hotel & far from thousands of tourists - then you just found a perfect place. The staff was kind and polite and made us feel like we are the most portant. They took care of us so well even though we didnt speak english at all. 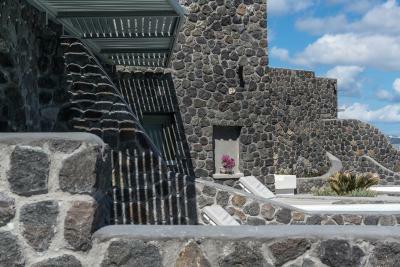 Moreover, the rooms were big and clean and the view of caldera was amazing. Thank you for everything! 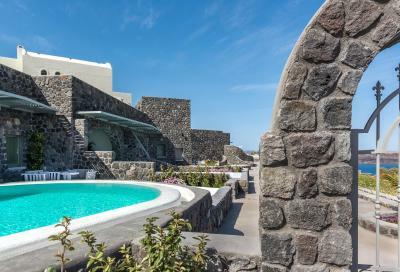 One of our top picks in Akrotiri.Blending traditional architecture with modern touches, Elements of Caldera Suites is set in Akrotiri. 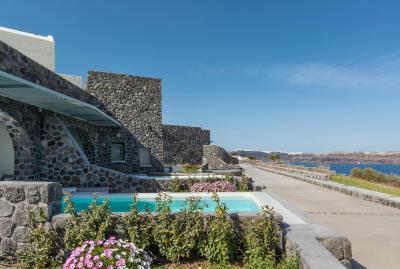 The hotel features 12 suites, each with Caldera and sea views. 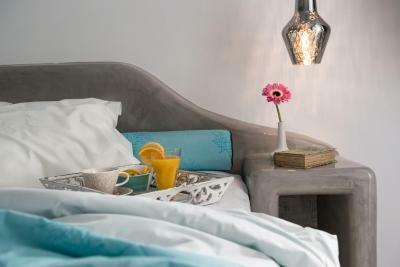 At the bed and breakfast, the rooms include a desk and a flat-screen TV. 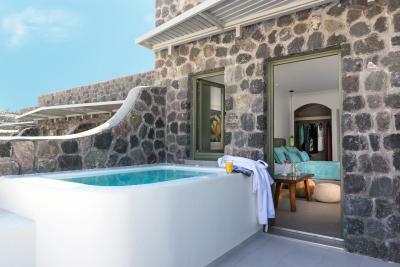 Rooms are fitted with a private bathroom and a shower, and some rooms at Elements of Caldera Suites have a terrace. 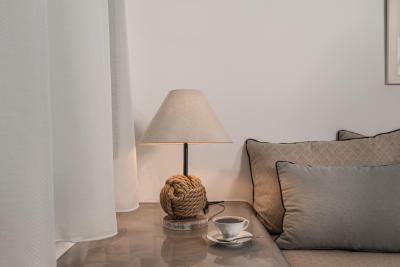 The units will provide guests with a wardrobe and a coffee machine. 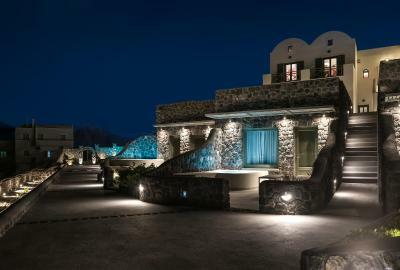 Archaeological Site of Akrotiri is 1.1 mi from the accommodations. 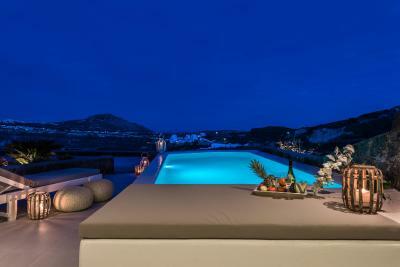 The nearest airport is Santorini (Thira) Airport, 5.6 mi from Elements of Caldera Suites. 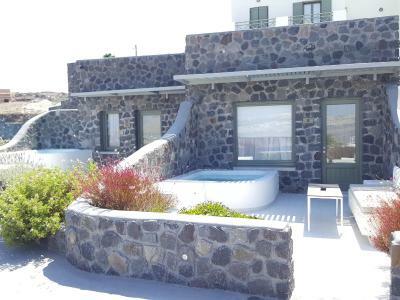 This property is also rated for the best value in Akrotiri! Guests are getting more for their money when compared to other properties in this city. 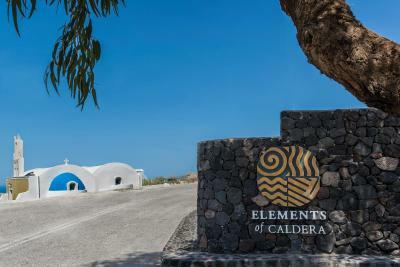 When would you like to stay at Elements of Caldera Suites? 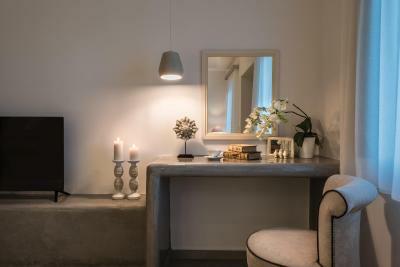 The Junior Suites are designed with style and equipped for comfort. 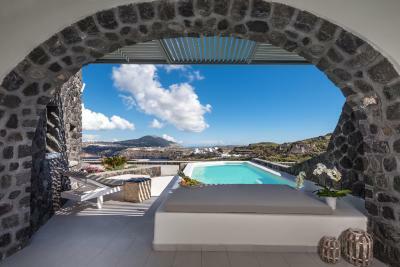 Spacious and bright suites with an outdoor jetted tub, a private veranda and views to the famous Caldera. 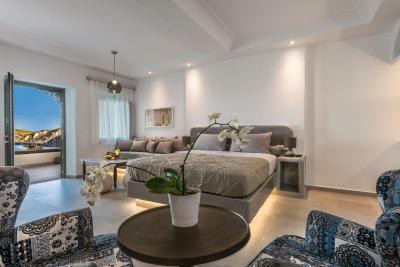 They also come with a king size bed, a sofa and a modern bathroom. 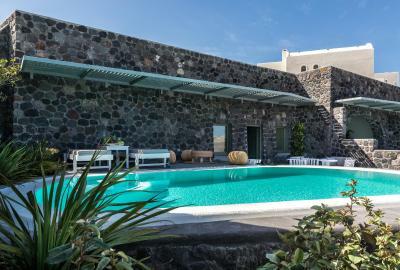 Spacious and bright suite with an outdoor pool, a private veranda and direct views to the Aegean Sea and the famous Caldera. It comes with a king size bed, a sofa and a modern bathroom. 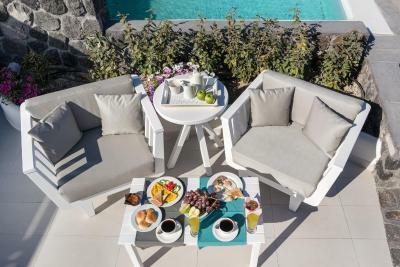 Spacious and bright suite with an outdoor pool, an indoor hot tub, a private veranda and direct views to the Aegean Sea and the famous Caldera. 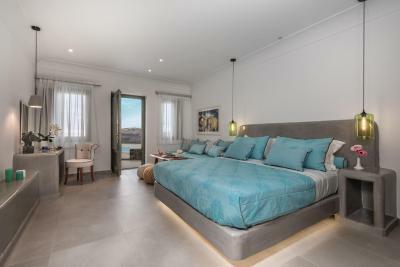 It comes with a king size bed, a sofa and a modern bathroom. 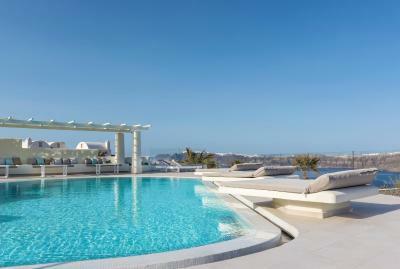 Spacious suite featuring an outdoor pool, an indoor hot tub, a private veranda and direct views to the Aegean Sea and the famous Caldera. It comes with a king size bed, a sofa and a modern bathroom. 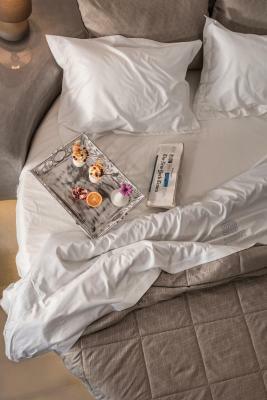 The Junior Suites are designed with style and equipped for comfort. 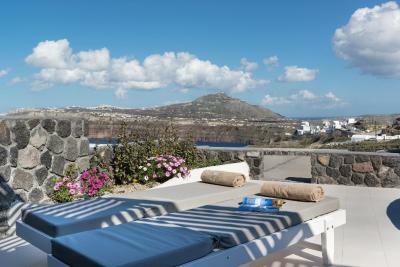 Spacious and bright suites with a jetted tub, a private veranda and views to the famous Caldera and the Aegean Sea. They come with a king size bed, a sofa and a modern bathroom. 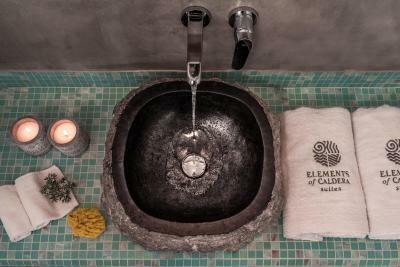 House Rules Elements of Caldera Suites takes special requests – add in the next step! 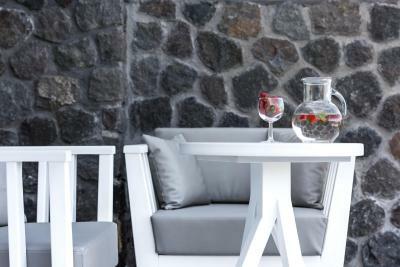 Any additional adults are charged EUR 70 per night for extra beds. 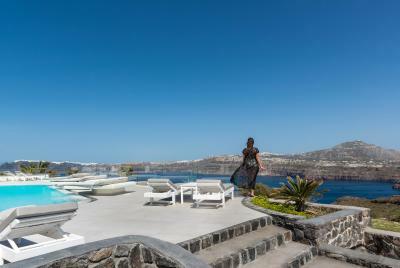 Elements of Caldera Suites accepts these cards and reserves the right to temporarily hold an amount prior to arrival. Please inform Elements of Caldera Suites of your expected arrival time in advance. You can use the Special Requests box when booking, or contact the property directly using the contact details in your confirmation. The rooms were spacious, comfy and clean. 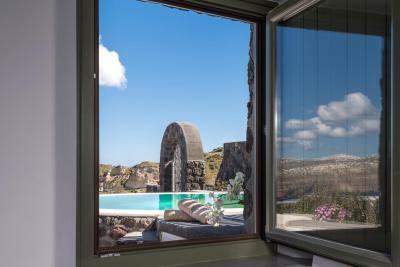 Amazing new hotel with a marvellous view to the caldera. We had a fantastic stay. The hotel design is one of a kind. The room was really beautiful and comfortable. Service was perfect, the staff is really friendly and makes you feel satisfied. Breakfast was amazing. 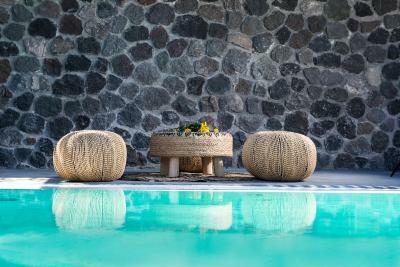 Pool area is relaxing, with really comfortable sunbeds. 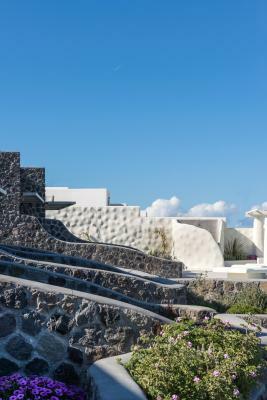 Despite being located far from the main spots of the island, it really isn't an issue because it's a place designed to be far from crowds and provide a nice ambient to relax. I recommend it to everyone. Would definitely go back. Please avoid booking a tour with the hotel! We had a bad experienced because they could not confirm the place where we would be picked up. Julia was not very willing to help and acted as if we were annoying her with our questions. It's a shame as the rest of the staff always treated us wonderfully! Not a dislike but would prefer the place to have a food and drink area , as would give guests more choice . 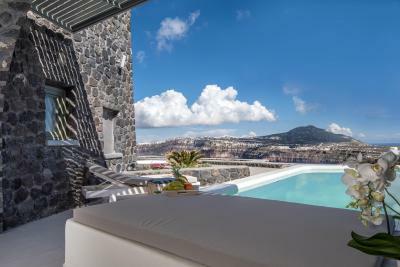 The beautiful view and gorgeous rooms and surroundings .I loved how quiet the area was , I loved the staffs willingness to help , they are headed by Julia , nothing is too much trouble and information on things you want to do are ready available .